Recently, we shared with you the story of Ian Young, a veteran of the Royal Regiment of Fusiliers. After 11 years of service in Northern Ireland, Bosnia and Kosovo, Ian developed PTSD and was successfully treated by PTSD Resolution. 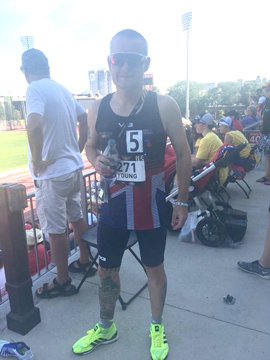 We caught up with Ian after his recent trip to Canada where he represented Great Britain in the Invictus Games, a sporting event designed to promote recovery among veterans and to raise awareness of the many hardships they often face. 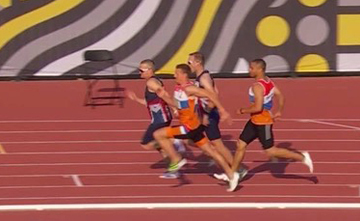 Ian was one of 90 competitors to be selected for Team GB. Here, he talks about what inspired him to get involved and how he and the team fared in Canada. "I first saw the Invictus Games at their launch in 2014. While following the progress of the Games, I was amazed by how well these athletes used sport as a coping tool and to aid their recoveries, more generally. While I used running in a similar manner, I never envisaged that I might make it onto the team and actually compete in the future. I believed that the Games were only for veterans who had been severely wounded and injured during service and not for somebody like myself, who had suffered from PTSD. 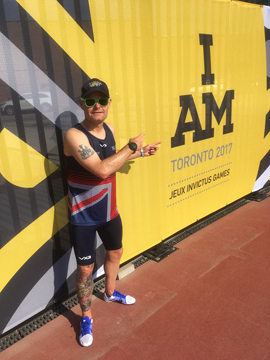 Thanks to the encouragement of friends and family, I decided to apply for the 2017 Invictus Games and was invited to the first athletics session at Loughborough in January. I felt really nervous about going as I still had this idea that the Games were only for veterans with obvious physical injuries, but how wrong I was. At the training session, I met men and women with all manner of injuries, including mental health problems. I immediately felt at ease and started getting to know the competitors and the staff. I felt a genuine buzz of excitement, the first I had experienced since leaving the Army ten years ago, because it felt like I was back in the forces family. Over the next few months, I underwent a process to see if I met the criteria for the Games. People are not selected for the Games solely on the way they perform in their chosen sport. In fact, selection is based the stage of recovery you're at and how much you can personally benefit from taking part. This process culminated in a selection day, attended by Prince Harry himself! After this, a selection board drew up a final list of 90 competitors, along with the reserves. I was lucky enough to make the team and the next step was to attend the team launch at the Tower of London. Incidentally, the tower is my regimental HQ, which made the day even more special. We had a meet and greet with Prince Harry, attended by the world's media. Once the publicity was done, it was time to get down to work and begin a series of training camps to get ready for the Games. At the Games, I competed in the 1500m race and the 4 x 100m relay. The experience was fantastic, and I had the support of family and friends for the duration. The road to the next Invictus Games has already started: I've sent off my application and have my first training session in November. From start to finish, the Invictus journey has been an amazing, life-changing experience. I have enjoyed every minute of it, from the selection process to the actual games. Prince Harry advised us all to set post-Invictus goals and to continue on our own, personal journey. I have set a long-term goal of continuing my recovery progress while also helping to inspire others to get help for their injuries, whether these are physical or mental. Having seen it first-hand, I know that anything is possible if you really want it. Whatever the outcome for the next Invictus Games, I am extremely grateful to PTSD Resolution for saving me. Without their help and support, I know I wouldn't be here today."